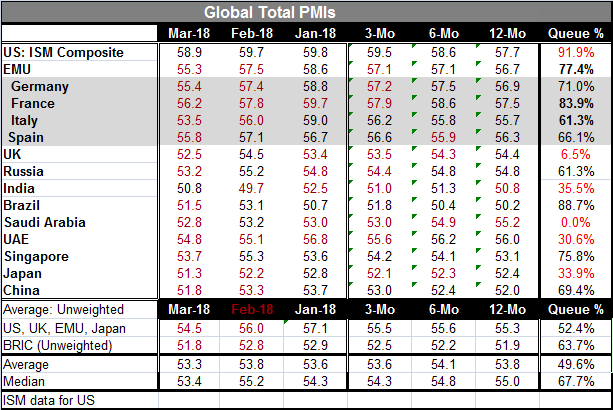 The global PMIs have largely weakened in March. Much of this is on the back of weakening services sectors (see Chart). Of the 14 countries listed in the table (excludes EMU), all but one, India, weaken in March compared to February. In February seven have weakened; in January the number weakening was six. With this very substantial breadth of March weakening in place, the three-month averages of the total PMIs show weakening in only eight countries. The six-month averages are weaker than the 12-month averages in only four countries: Spain, U.K., Saudi Arabia and Japan. Over 12 months the indexes are weaker than their year 12-month average in only India and Saudi Arabia. The unweighted averages for the U.S., U.K., EMU and Japan show not much change. There is a slight pick-up over six months and slight weakening over three months. The unweighted BRIC averages show steady progress. The overall averages are little changed while the overall median shows steadier erosion. The queue percentile standings evaluate the current diffusion values placing them as percentile standing in their historic queue of data back to January 2012. On that basis, only the U.S. reading has a 90th percentile standing or higher. The EMU is in its 70th percentile range with an 83rd percentile standing in France and 60th percentile standing for Italy and Spain. Emerging as extremely weak are Saudi Arabia with its lowest reading on record for the period and the U.K. at a 6.5% standing. India, The UAE and Japan have standings in their respective 30th decile. That’s only five countries with readings below their respective medians. Still, there is much less in the way of very strong readings than there had been even several month ago. It is not a propitious time for demand to come up flat, but even before any tariffs have been slapped on anything retail sales in Europe are weakening. February shows a weak 0.1% rise in EMU sales, but there is a clear loss in momentum as growth rates step down from 12-month to six-month to three-month with the three-month pace logging a contraction at a 4.8% annual rate. Vehicle registrations in Europe also are off over three months and showing the same sequential downshifting. I have been flagging slowing as an issue to watch; demand seems to be evaporating. In the U.S. retail sales have fallen for three straight months. However, a March gain in unit vehicle sales should put a stop to that run of bad news. Yet, there remains a question about demand in the U.S. and EMU. With that, there is the further question of where demand will come from? We do see some slight revival registered in the BRIC aggregate. Brazil is actually on a strong rebound while India has barely edged above neutral to register some growth instead of contraction. But that is thin gruel for good news. The U.S. and China are spitting venom back and forth, but it is at the same time being calibrated and some of it, I think, is for show. China has not been a very good negotiating partner. Our most visible experience with it was over the South China Sea where China laid a claim and was rebuffed by the World Court. In the end, it refused to scale back its claim in any way. China has mostly been trying to elbow its way into world organizations for respect and to be able to flex its muscle. China got its currency recognized as it did successfully have it embedded in the SDR. But China has not always followed through with the promises it has made to get those recognitions. China has been good at throwing its weight around and having it both ways. It plays the developed/underdeveloped card flipping the side up that suits it best for the argument du jour. It is a huge country as far as population goes. Its GDP is growing fast and China has climbed the league tables for size. However, on the trade front, it has sought to have its economy recognized as a ‘market economy’ so that its domestic prices could be taken at face value as market prices instead of evaluated from other markets as benchmarks. China fought hard for that recognition but was not successful. That leaves the rest of the world with more leverage over China to assess its practices. In China, state owned enterprises are very important players. Bank lending is often centrally directed. And of course China is a communist country and it makes no bones about that. China clearly lives in a nether world when assessing competition is concerned. And China’s tendency to strong-arm foreign countries and force technology transfer or to outright steal it is substantially what the U.S. trade pressure is all about. These are tariffs meant to strip away layers of bad policy from China, to make it actually be more of the ‘free trader’ that it wants us to pretend that it is. This industrial action by the U.S. is very different from the traditional ‘trade war’ most people think about. Stay tuned and stay alert. It seems like the U.S. is throwing the first punch, but actually it is a very, very, long overdue counter-punch.